This super food is grown on a bush with deep green and red foliage that flowers in the spring. Native to North America, Aronia Berries are high in antioxidants, vitamins and phytonutrients that provide wonderful health benefits. University studies have shown numerous benefits to including Aronia in your diet. Why Are Our Berries Superior? 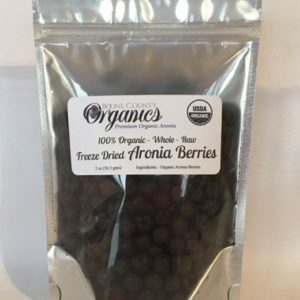 premium organic Aronia Berries with 3x the Vitamin A and 4x the Iron of average Aronia. We specially freeze dry the whole berry in our products locking in a wide profile of antioxidants – 4x that of blueberries. Once freeze dried, they require no refrigeration and can be enjoyed in any location. 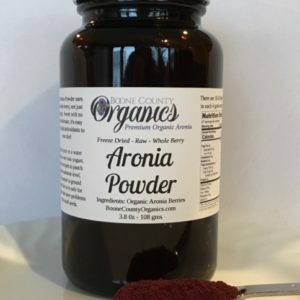 We are developing exciting new ways for you to enjoy this amazing super food, stay tuned for new aronia products coming soon! Boone County Organics makes no specific claims as to the curative effects of our products. The information given is drawn from research done by many individuals in many studies. 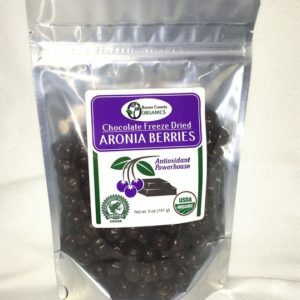 For direct on line links to these studies, please visit our website and click on the ‘Aronia Health Benefits” button at the top of the page. Links to studies used to compile this section can be found below. – Polyphenols-Rich Natural Products for Treatment of Diabetes! 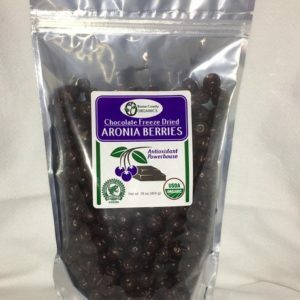 Aronia Berry Health Benefit by Ray Sahelian, M.D.